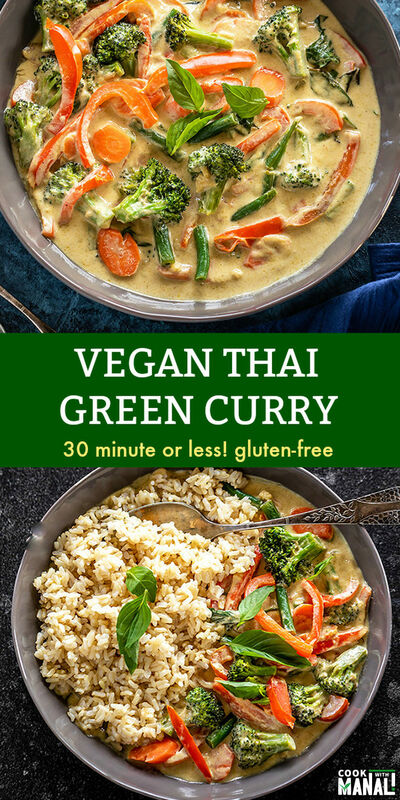 Easy Vegan Thai Green Curry- so creamy, so flavorful and gets done in less than 30 minutes! Serve it over brown rice for a hearty meal! It’s also gluten-free. 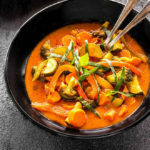 Thai curries are my some of my favorite things to eat. I order them when we eat at Thai restaurants and also make them frequently at home. 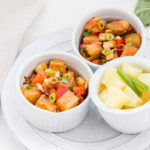 The best part about these curries is that not only are they super flavorful but they also get done in less than 30 minutes! So it’s perfect for days when you don’t have a lot of time to make dinner. I start by sauteing the veggies first. This is optional, you can skip this step and straight away add veggies to the curry and simmer. I like my veggies in Thai curry extra crunchy, so I like sauteing them first before adding to the curry. For this curry I used broccoli, green beans, peppers and carrots. You may use zucchini, asparagus or any other veggies that you like. I prefer crunchy vegetables in my Thai green curry. So once the veggies are sauteed, I then make the curry by cooking the curry paste and coconut milk together. It comes together in like 15 minutes! Yeah, super easy recipe and great for those busy days. You can make it whatever veggies you have in the refrigerator. And to finish off the curry, I add some Thai basil leaves. If you can, do not replace the thai basil with Italian basil. Yes, it makes a difference to the final taste. Sometimes, I also add some kaffir lime leaves to the curry just before serving. This is optional but if you can get a hand on these, do add them! They enhance the flavor! 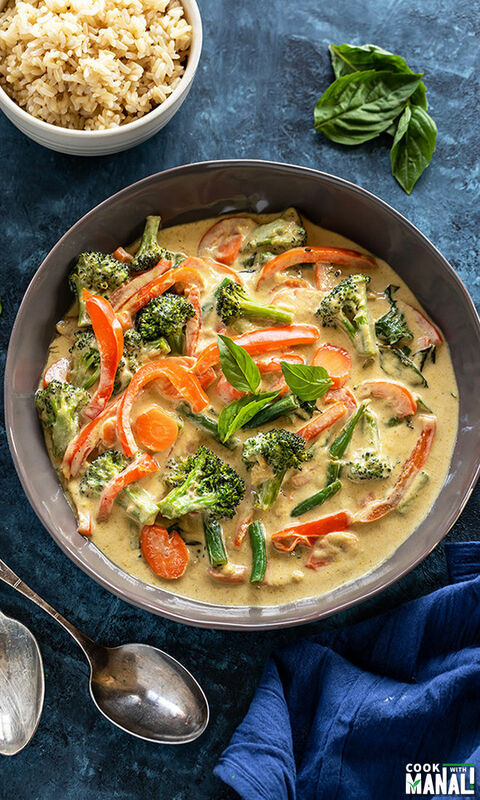 A good Thai curry is all about a good curry paste and a good coconut milk. Of course the best would be to make the curry paste at home but we are all looking for shortcuts to make our life easier, isn’t it? And when you can get a good curry paste in the market, then you might as well use it! Over the years, I have tried several green curry paste brands and I finally have a favorite- Maesri Green Curry Paste! It’s so flavorful you guys, I highly recommend it. Be careful though, it’s pretty hot too. So if you use this paste, be careful about how much paste you are adding into the curry. I added 2 tablespoons of the paste in this curry and it was okay for me, if you can’t handle heat at all, you might consider adding only 1 tablespoon. Of course if you love spice, add extra tablespoons! And now coming to the coconut milk, I highly recommend Chaokoh Coconut Milk. The taste of this milk is so much superior to any of the canned coconut milk that I have used in my cooking. And guys, none of this is sponsored. I am just sharing the products which I really love and I think that if you use them, your curry will get like 5 times better! 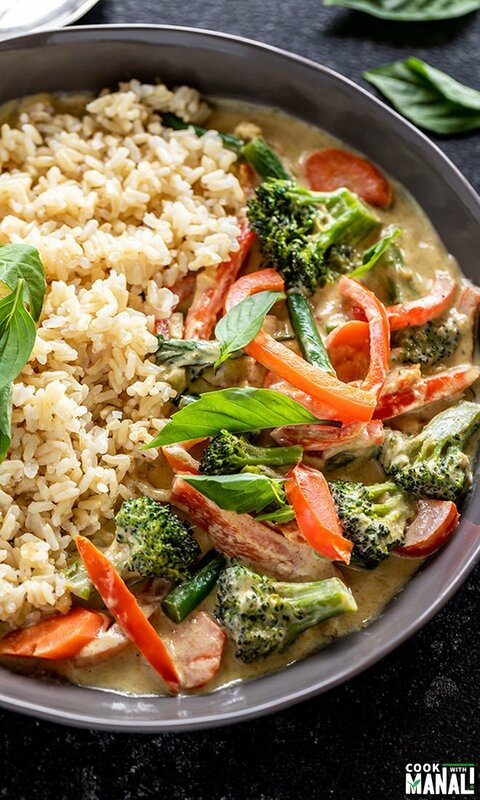 Serve this vegan Thai Green Curry over rice or quinoa for a perfect meal. Also leftovers are great! 1- Heat 1 tablespoon oil in a pan on medium high heat. Once the oil is hot, add all the veggies to the pan. 2- Toss the veggies for around 2 minutes on medium high heat. This step is optional and you can directly add the veggies to the curry as well. I like tossing them in little oil before adding to curry for texture. 3- Meanwhile heat the remaining 1 tablespoon oil in a heavy bottom pan or skillet on medium heat. Add garlic and ginger and cook for 1 minute until it starts changing color. 4- Add the green curry pasta and sliced thai chilies, if using. Saute the curry paste for 1 to 2 minutes, stirring often. 5- Then add the coconut milk. Stir continuously with a whisk until it’s all combined. 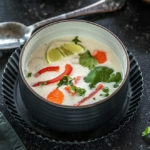 6- Let the coconut milk cook on medium heat for 3 to 4 minutes. It will come to a light simmer and become thick and creamy. 7- Stir in the veggies and mix. 8- Cook for 2 to 3 minutes until slightly softened. They are already half cooked, you want them crunchy. 9- Add tamari. You can use soy sauce if you want. 10- Also add the coconut sugar. 11- And the salt and mix everything together. 12- Add in the thai basil leaves and mix. At this point, also add the kaffir lime leaves, if using. Remove pan from heat. Adjust the consistency of the curry at this point. You can add water to thin it out, I did not add any water. 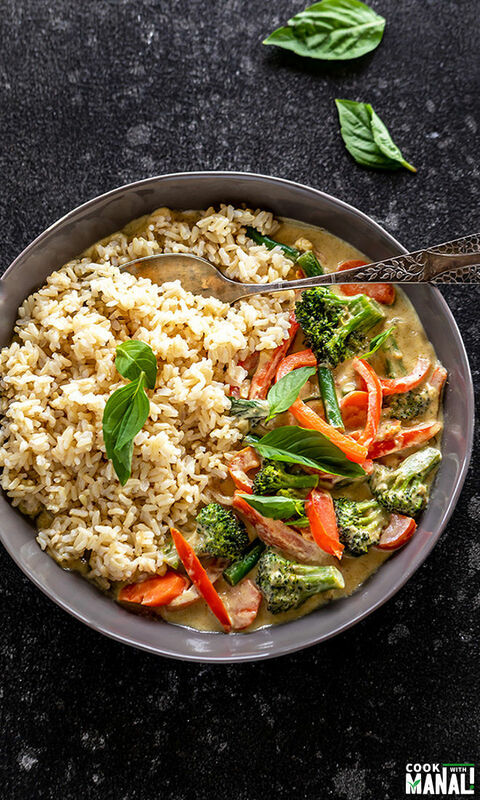 Serve this vegan Thai Green Curry with brown rice or jasmine rice. Enjoy! 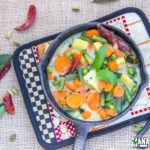 If you’ve tried this Vegan Thai Green Curry Recipe then don’t forget to rate the recipe! You can also follow me on Facebook, Instagram to see what’s latest in my kitchen! 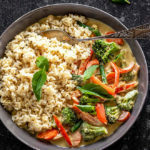 Easy Vegan Thai Green Curry gets done in 30 minutes! Packed with fresh veggies and so much flavors, it's the perfect meal to whip up on busy days. Gluten-free! Heat 1 tablespoon oil in a pan on medium high heat. 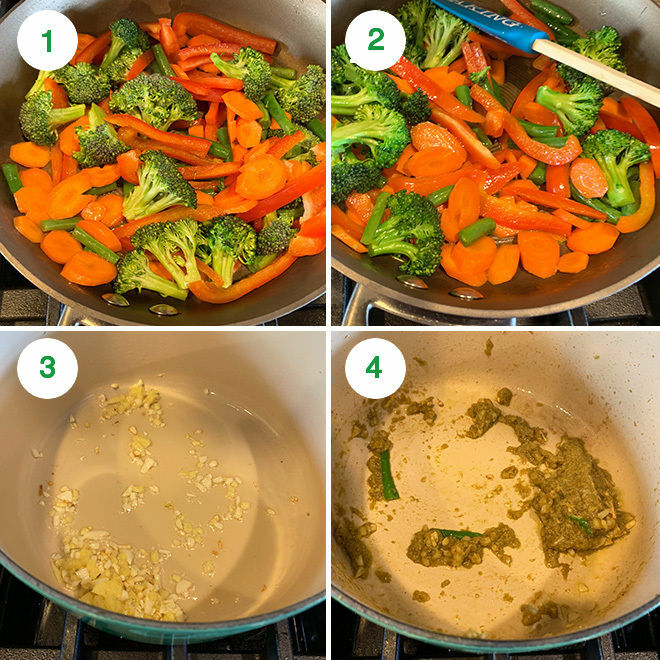 Once oil is hot, add all the veggies to the pan. Toss veggies for around 2 minutes on medium high heat. This step is optional and you can directly add the veggies to the curry as well. I like tossing them in little oil before adding to curry for texture. Meanwhile heat the remaining 1 tablespoon oil in a heavy bottom pan or skillet on medium heat. Add garlic and ginger and cook for 1 minute until it starts changing color. Add the green curry pasta and sliced thai chilies, if using. Saute the curry paste for 1 to 2 minutes, stirring often. Then add the coconut milk. Stir continuously with a whisk until it's all combined. Let the coconut milk cook on medium heat for 3 to 4 minutes. It will come to a light simmer and become thick and creamy. Stir in the veggies and mix. Cook for 2 to 3 minutes until slightly softened. They are already half cooked, you want them crunchy. Add tamari, coconut sugar and salt and mix everything together. Add in the thai basil leaves and mix. At this point, also add the kaffir lime leaves, if using. Remove pan from heat. 1. 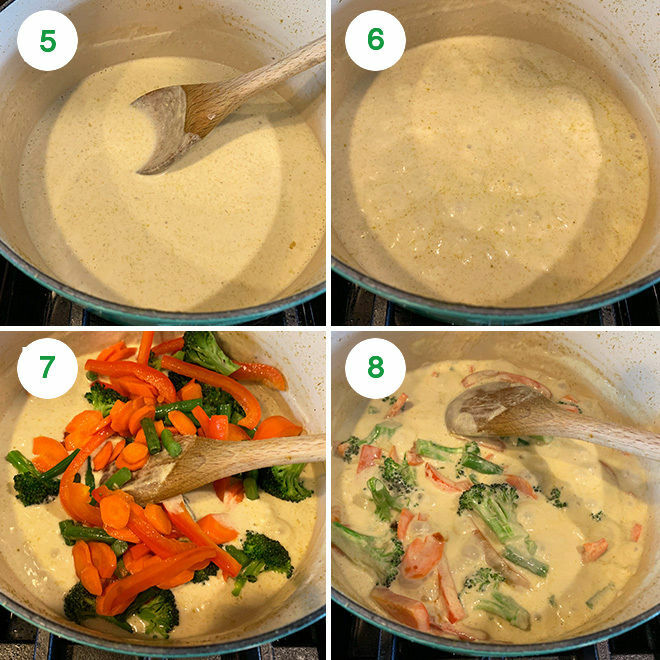 Do use Maesri green curry paste and Chaokoh coconut milk. It makes all the difference! Or use your favorite homemade curry paste. 2. 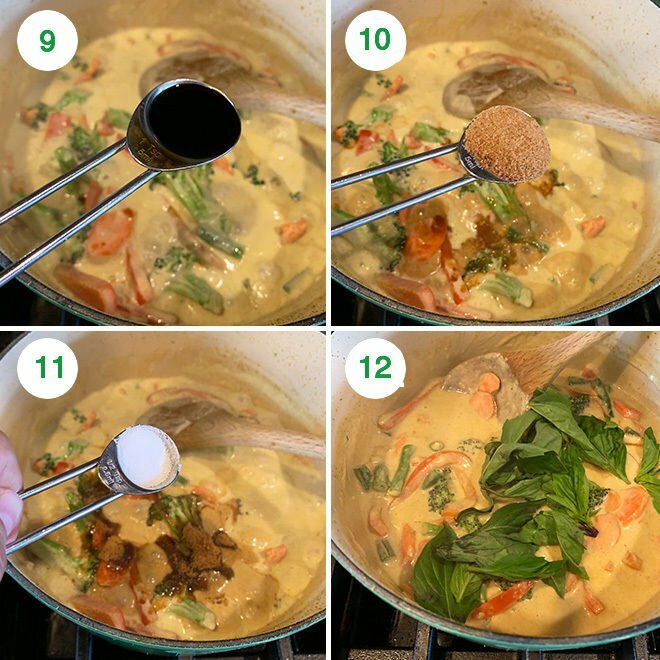 Maesri green curry paste is hot, so use carefully. 2 tablespoons was okay for me, if you can't tolerate heat, use 1 tablespoon. 3. You can thin out the curry if you like by adding some water. Don't add a lot of it though, the curry is supposed to be creamy. 4. Once it cools down, the curry really thickens so you will have to add some water while re-heating.